Easily transport tasty treats to any party! The Collapsible Cupcake and Cake Carrier holds up to 24 cupcakes, a 10Ó (25.4 cm) layer round or 9Ó (22.8 cm) square cake. Tiered cupcake tray is extra tall to allow for heaps of decorative frosting. Cupcake trays feature deep holes for cupcakes so they wonÕt tip over while transporting and finger recesses for easy removal without getting hands messy. Remove cupcake trays from the carrier to reveal the flat base with built in slicing guide for serving layer cake. 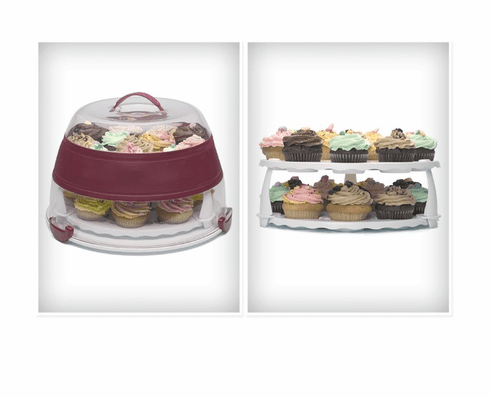 Cupcake trays fold up and nest inside the cake carrier, which collapses to 1/3 its original height for easy storage. Remove cupcake trays to accommodate layered-round and square cakes.